Cassava peels can represent 5 to 15% of the root (Aro et al., 2010; Nwokoro et al., 2005a). They are obtained after the tubers have been water-cleansed and peeled mechanically (Aro et al., 2010). They may contain high amounts of cyanogenic glycosides and have a higher protein content than other tuber parts (Tewe, 2004). Cassava pomace, also called cassava fibre, cassava bran, cassava bagasse, cassava starch residue and cassava pulp: all these terms refer to the solid fibrous residue (up to 17% of the tuber) that remains after the flour or starch content has been extracted (Aro et al., 2010). The quality and appearance of these residues vary with plant age, time after harvest and industrial equipment and method used (Cereda et al., 1996). Cassava sievate or garri sievate is the by-product of the production of garri (also spelled gari or gary), a popular West African food. Tubers are peeled, crushed and then fermented. The resulting product is then sieved and roasted. The sievate represents 15-17% of the root in weight (Nwokoro et al., 2005a). Cassava stumps are the ends trimmed off the cassava tubers as they are manually prepared for onward transmission into the rotary washer and peeler (Aro et al., 2010). Cassava whey is the liquid pressed out of the tuber after it has been crushed mechanically. 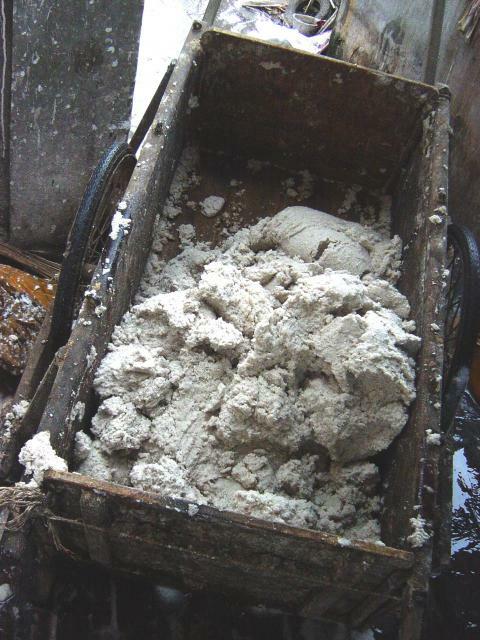 The whey and the pomace may be mixed together to form an effluent (or slurry) (Aro et al., 2010). Discarded tubers: tubers that fail to meet quality standards for processing are discarded and can be used for animal feeding. Discarded tubers are sometimes still attached to the peduncle and therefore may contain more fibre. They may also be mixed with the stumps (Scapinello et al., 2005). Cassava by-products are generally found in the vicinity of factories where cassava tubers are processed into starch or flour. Fresh cassava peels have 3 main deficiencies: they spoil very quickly, they contain phytates and large amounts of cyanogenic glycosides. They should thus be processed in order to reduce cyanogenic potential and phytate content and to preserve their nutritive quality (Oboh, 2006; Salami et al., 2003; Tewe, 1992; Adegbola et al., 1985). Different processes are effective in reducing cyanogenic glycoside including sun-drying, ensiling, and soaking + sun-drying. All these methods have yielded satisfactory results (Salami et al., 2003; Tewe, 1992; Adegbola et al., 1985). Good quality silage can be obtained after chopping the peels to equal lengths of about 2 cm for easy compaction, and wilting for 2 days to reduce moisture content from 70-75% to about 40%. Under these conditions, cassava peel silage after 21 days was light brown in colour, firm in texture and had a pleasant odor. The pH was 4.4, and no fungal growth was observed (Asaolu, 1988 cited by Smith, 1988). In Nigeria, drying cassava peels on black plastic sheets has been drawing the attention of smallholders and was the winning project of the 2008 Global Development Marketplace (a grant program held by the World Bank): "Using cassava waste to raise goats" (Adebayo, 2008). Solid fermentation of a mixture of cassava peels and waste water from fermented cassava pulp with Saccharomyces cerevisiae and Lactobacillus spp. resulted in a product with a higher protein content, lower cyanogenic glycosides and lower phytate content (Ubalua, 2007; Oboh, 2006). Cassava pomace (also called bagasse, bran or pulp) contains less cyanogenic glucosides than the peels. It can be dried or ensiled. To ensile, cassava pomace is ground with the addition of either 0.5% salt (on fresh weight basis) or rapidly fermentable carbohydrates, such as ground maize or molasses, before being placed in anaerobic conditions in pits or plastic bags. Addition of urea and minerals is also possible (Ubalua, 2007). Cassava processing produces large amounts of waste and is generally considered to contribute significantly to environmental pollution (FAO, 2001). A cassava starch production unit processing 100 tons of tubers per day has an output of 47 tons of fresh by-products, which may cause environmental problems when left in the surroundings of processing plants or carelessly disposed of (Aro et al., 2010). In Nigeria, for example, cassava wastes are usually left to rot away or burnt to create space for the accumulation of yet more waste heaps. The heaps emit carbon dioxide and produce a strong offensive smell (Aro et al., 2010; Adebayo, 2008). Cassava peels (large amounts of cyanogenic glucosides) and pomace (large amounts of biodegradable organic matter) may cause surface water pollution especially if they are stored under heavy rain or simply disposed of in surface waters (Pandey et al., 2000; Cereda et al., 1996; Barana et al., 2000). The presence of a large processor or several small processors can cause the eutrophication of slow moving water systems, notably during the dry season. However, cassava processing does not seem to affect groundwater supply, except occasionally in the immediate surroundings of processing units, due to leaching through the soil. Starch extraction requires large volumes of water and may cause water depletion, but in most areas this problem is minimized by the adoption of processing technologies suitable for the water resources available (FAO, 2001). Generally, the long-term and broad-based impact of cassava processing on the environment can be corrected by proper waste treatment (FAO, 2001). The use of cassava by-products as feedstuffs or as an alternative substrate for biotechnological processes is a positive way to alleviate environmental issues (Pandey et al., 2000). Cassava peels have a low protein content (< 6% DM) and a high and variable fibre content (crude fibre in the 10-30% DM range). Cassava pomace is a highly variable by-product as its composition is driven by the starch extraction technology used in the processing plant (Kosoom et al., 2009b). Its protein content is very low (1-4% DM). Starch content can vary between 15 and 50% DM and NDF content is more than 35% DM (Kosoom et al., 2009b; Ubalua, 2007). Fresh cassava pomace contains mostly water (75-85%) (Ubalua, 2007). Bitter varieties with roots containing 0.02-0.03% HCN (DM basis) and leaves containing up to 0.2% HCN (fresh basis) (Murugesrawi et al., 2006). These have to be processed before being used as feed. Sweet varieties with roots containing less than 0.01% HCN (DM basis) and leaves 0.1% HCN (DM basis) (Murugesrawi et al., 2006). These can be fed raw. Most commercial varieties belong to this group. Bitter varieties have often longer and thicker roots than the sweet varieties, but there is no simple and safe method to assess HCN content. However, HCN can be relatively easily removed from cassava by-products, as shown in Processes on the "Description" tab. Well-processed cassava peels have generally acceptable levels, below 50 mg/kg (Osei et al., 1989; Nwokoro et al., 2005b). However, mass HCN poisoning has been reported in a intensively managed Nigerian pig farm, where more than half of the herd died within a few hours after consuming boiled and overly ripe cassava peels from a bitter variety. Treating the surviving pigs with antibiotics and palm oil saved some of them (Sackey, 2002). Cassava peels have a high phytate content (up to 1% DM), resulting in low P availability in non-ruminants (Ubalua, 2007). Fermentation can slightly reduce phytate content (down to 0.7%) (Oboh, 2006). Cassava peels can be used as a roughage and as an energy feed in ruminant diets. However, sun drying, ensiling and fermentation should be used to prevent HCN poisoning when feeding bitter cassava varieties (Pipat Lounglawan et al., 2011; Smith, 1988). Cassava peels should not be fed alone, as their protein and mineral content cannot support optimum rumen function and productivity. Their optimal utilization requires supplementation with readily fermentable protein and by-pass protein, as well as micronutrients including sulphur, phosphorus, and vitamin B. If fed in a balanced diet, cassava peels are a valuable feed for ruminants (Smith, 1988). Cassava peels are highly digestible products, with reported values of 78% and 81% for DM and OM total tract digestibility respectively (Baah et al., 1999). Dry matter degradability is also high, with reported values more than 70% (Smith, 1988). In Ghana, weight gains of 0.29 or 0.33 kg/day (vs. 0.07 kg/day for the control diet) were recorded with crossbred grazing bullocks supplemented with dried or ensiled peels (Larsen et al., 1976). In an experiment with bulls in Vietnam, total DMI increased with the amount of cassava peels while grass DMI decreased (Pham Ho Hai et al., 2009). Because of their high degradability, cassava peels are also used as an energy supplement in cattle: cassava peels can partly replace (30% of total DMI) energy concentrates, with no influence on the intake, digestibility, microbial efficiency, and nitrogen retention (Azevêdo et al., 2011). Many trials have been carried out with sheep in Sub-Saharan Africa. In Ghana, Djallonké lambs lost weight after consuming a total diet of cassava peels: supplementation with Ficus exasperata leaves resulted in weight gains and in a significant increase in cassava peels DMI (from 44 to 58 g W0.75/d) (Baah et al., 1999). In Cameroon, sheep fed either 0, 35 or 70% of the diet as cassava peels (and 70, 35 and 0% Pennisetum purpureum), with cottonseed cake as the protein source, gained 45, 107 and 227 g/d respectively. Dry matter intake, digestibility and growth rate increased linearly with increasing dietary levels of cassava peels (Fomunyan et al., 1987). Sheep may use ensiled cassava peels better than sun-dried peel: in Nigeria, sheep fed a diet containing 80% ensiled cassava peels had greater daily gains (81 vs. 59 g/d) than those fed sun-dried peels (Asaolu, 1988 cited by Smith, 1988). In Nigeria, a 60:20:20 ensiled mixture of grass-legume (Guinea grass and tropical kudzu Pueraria phaseoloides), cassava peels and poultry excreta fed to West African Dwarf goats resulted in favorable consumption and digestibility, as well as normal rumen and blood metabolites. It was recommended to use cassava peels as an energy supplement in anticipation of dry-season feeding (Okeke et al., 1987). In Red Sokoto goats, ensiling cassava peels with Pennisetum purpureum had beneficial effects on silage properties, intake and digestibility, and it was proposed that cassava leaves form at least 30% of silage made from Pennisetum purpureum to improve productivity during the dry season (Olorunnisomo, 2011). Sun-dried cassava peels included at up to 74% in supplement rations where they completely replaced maize offal did not affect liveweight changes in pregnant Red Sokoto goats grazing native pasture (Lakpini et al., 1997). Cassava pomace has a lower feeding value than cassava roots but can be included in ruminant diets. Cassava peels are a good feed for pigs, but they must be supplemented with protein and lipids in order to improve their palatability and digestibility (Iyayi et al., 1992). The fibrous nature of the feed may also limit its inclusion in pig diets (Adesehinwa et al., 2011). Most studies on the use of cassava peels in pig diets have been carried out in Nigeria. Typical inclusion rates are about 30% though rates up to 60% have been found economically sustainable due to the lower price of cassava peels compared to that of maize. Cassava peels can be introduced at up to 30% in piglet diets without affecting growth rate. In older pigs (35 kg), up to a 57% inclusion had no deleterious effect on daily gain, feed intake, feed conversion ratio and carcass characteristics, and the use of cassava peels as a partial replacement for maize in young pig diets was shown to be cost effective (Balogun et al., 1997). In a similar experiment, a 40% level of cassava peels in place of maize was adequate for growing pigs, though a dietary protein content of at least 15% was necessary for satisfactory performance (Iyayi et al., 1992). Other authors have also concluded that cassava peel meal can be included in the diets of growing pigs up to 30%, in order to reduce feed costs, without any detrimental effect on performance (Irekhore et al., 2006), or up to 60% (total replacement of maize) when the maize price is high (Bawa et al., 2007). In growing pigs, inclusion of cassava peel meals up to 38% with 5.4% palm oil gave a better economic performance than other combinations of peels and palm oil (Damisa et al., 2009). Several methods have been tested to enhance the feeding value of cassava peels for pigs. In pigs fed a diet containing 30% cassava peels, adding an enzyme cocktail enhanced diet utilization and was as effective as the maize-based control diet (Adesehinwa et al., 2011). Biodegradation of cassava peels with Trichoderma viride resulted in a higher protein content (16%) but was more expensive and did not significantly improve performance (Arowora et al., 2005). Cassava pomace is extensively used for pigs in Southeast Asia, where it is regarded as a valuable feed (Göhl, 1982). Its energy value is quite good but highly variable and depends on the processing technology (ME 9.6 to 12.9 MJ/kg DM; Kosoom et al., 2009a; Tonsing et al., 2008). Cassava pomace was found to be detrimental to the performance of growing pigs at levels as low as 7% (Bertol et al., 1999). Likewise, a diet containing 10% of cassava pomace had negative effects on the average daily gain and feed conversion ratio of weanling pigs though it did not affect feed intake (Taksinanan et al., 2010). However, a 15% inclusion rate was not detrimental to piglets (Kosoom et al., 2009b). In another experiment the authors reported that including 30% cassava pomace in pig diets from the starter to the finishing period was feasible (Charoenwattanasakun et al., 2009). Generally, older pigs seem to be less sensitive to the detrimental effects of cassava pomace: up to 30% cassava pomace in the diets of finishing pigs did not affect performance (Bertol et al., 1999). It is possible that the value of cassava pomace for young pigs depends on its fibre content. In Vietnam, cassava root waste, included at 25% in the diet, could completely replace cassava root meal provided that the diet contained 5% catfish oil. This diet significantly improved growth performance without affecting carcass quality, and resulted in the best economic benefit (Le Thi Men et al., 2004). Dried cassava starch residue can be included at 30% in the diet of gestating sows without any effect on the reproductive performance of both gestating and lactating sows (Kanto et al., 2005). Cassava peels can be used for poultry feeding after sun-drying, as well-processed peels contain HCN levels that are acceptable for poultry (Osei et al., 1989; Nwokoro et al., 2005b). Method of fermentation of cassava peels has been tested by several authors, either to lower HCN or fibre content (Osei et al., 1988) or to increase crude protein content (Buitrago, 1990), but the results are inconclusive. In some experiments, growth performance was maintained with broiler diets containing up to 15% cassava peel meal (Osei et al., 1988; Osei, 1992; Nwokoro et al., 2005b). Feed intake is generally not highly affected but depends on the feed formulation (isoenergetic diets or not). However, in some experiments performance decreased with 5% cassava peel meal in the diets (Egbunike et al., 2009; Osei et al., 1989). This can be due in part to problems in feed formulation since there is evidence that performance is degraded with inadequate protein inclusion (Egbunike et al., 2009). There can be an advantage in feeding fresh cassava peels for slow growing chickens (Ogbonna et al., 2000). The recommendation in broilers is to limit the incorporation of cassava peel meal to 5-10% depending on its quality, with an appropriate feed formulation. Higher levels of cassava peel meal could be fed to slow growing chicken, or in situations where depression in growth performance is counterbalanced by a lower feed cost. Sun-dried cassava peels at 10 to 40% inclusion rates resulted in significantly lower productive performance in layers, with an average of 15% less egg-lay when 20% cassava peel meal was included in the diet (Obioha et al., 1984; Salami et al., 2003). The effect on feed intake was not constant in these studies. Different processing techniques were tested to alleviate the negative effect of cassava peels: ensiling or boiling resulted in improved performance, but the rate of egg-lay was always lower than for the maize control diet (Salami et al., 2003). Cassava peels fermented in layer manure was not efficiently used (Osei et al., 1990). These results suggest that cassava peel meal should be used carefully in layer diets, with low inclusion rates (e.g. 5%). In conditions where the cost of raw materials is very high, the economic advantage of using higher levels of cassava peel meal could be tested. Cassava pomace is rich in fibre with a quite variable composition but small amounts can be included in broiler diets. With correct energy-formulation, cassava pomace did not significantly decrease broiler performance when included at 4% and 8%, while performance was depressed at higher levels (12% and 16%) (Khempaka et al., 2009). In Nigeria, cassava sieviate (by-product of the production of garri) was used successfully in layers, causing only a minor decrease in egg production when 15% sievate was included in the diet (Aderemi, 2006). Fermentation with Aspergillus slightly improved the rate of lay. In another experiment, feed intake and performance decreased with 10% pomace in the diet. Laying performance was improved by enzyme addition (Aderemi et al., 2006). Dried cassava peels could be introduced at up to 30% of the diet in balanced rations for growing rabbits as a source of energy to replace the corresponding amount of maize grain (Omole et al., 1990; Esonu et al., 1993; Agunbiade et al., 1999; Olorunsanya et al., 2007). Because the detoxification of cyanogenic glucosides requires the presence of methionine, balanced feeds that include cassava peels must contain enough sulphur-containing amino acids (Okeke et al., 1986). Fermentation or ensiling are at least as efficient as sun-drying to detoxify cassava peels and the resulting products can be used safely to feed growing rabbits (Okeke et al., 1986; Ahamefule et al., 2006). Water-soaking fresh peels for 1 to 5 hours before sun-drying also significantly reduced cyanogenic glucosides in amounts proportional to the duration of soaking (Shoremi et al., 1999). Water-soaked cassava peels replacing 20% maize in the control diet gave growth and slaughter performance identical or significantly better than those obtained with the control diet (Oluremi et al., 2002). However, extrusion of a diet based on dried cassava peels (totally replacing maize) was inefficient in all indices of measurement, as growing rabbits fed on this diet showed poor performance compared to those fed the non-extruded diet (Agunbiade et al., 2001). Cassava sievate introduced as 18-20% in growing rabbit diets (replacing the corresponding amount of maize grain) resulted in growth performance similar to, or slightly better than that obtained with the maize-based control diet (Ngodigha et al., 1995; Ekwe et al., 2011). A higher inclusion level (40%) reduced growth rate by 9% in comparison with the maize-based control diet, but the unit cost of feed to weight gain remained in favour of sievate utilisation (Ngodigha et al., 1995). Cassava meal residue is a mixture of cassava roots unsuitable for human consumption, and of root tips from the pre-processing cleaning stage. Its composition is close to that of the roots, with a high starch level (64%). It was reported that cassava meal residue may be added up to 26% of the diet of growing rabbits from weaning to slaughter, replacing completely the digestible energy from maize without any impairment in performance and carcass quantitative characteristics (Scapinello et al., 2005). In Nigeria, cassava peel meal fed at up to 30% of the diet to young tilapia (Oreochromis niloticus) decreased performance (lower weight gain, productive protein value, feed efficiency and feed intake). A maximum inclusion rate of 10% was recommended for feeding tilapia (Ugwu et al., 2004). 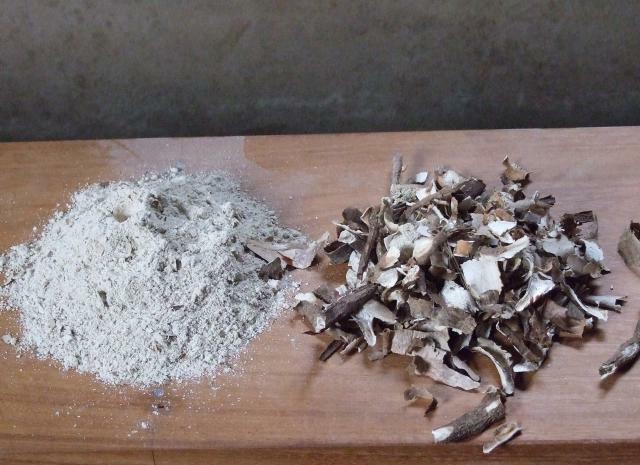 Cassava peels have been fermented with palm wine in order to prepare a protein-enriched diet that could replace fishmeal and soybean meal in tilapia fingerling diets. This feed resulted in a lower performance than with soybean meal, but higher than with fish meal. Using cheap cassava peels for protein production through fermentation might be a valuable way of feeding tilapia fingerlings (Ubalua et al., 2008). Asaolu, V. O, 1988. Utilization of cassava peels and Gliricidia sepium (JACQ.) Steud in the diet of West African Dwarf sheep. MPhil. thesis. Obafemi Awolowo University, Nigeria.